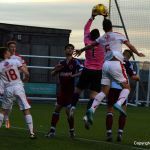 Raith went into this game in confident mood having won three out of four competitive games this season, losing only narrowly to Falkirk at the weekend and having conceded only one goal. 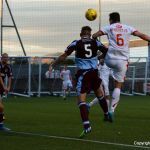 Stenhousemuir had a similar record so far this season, but were unbeaten having won 2 cup games and won one and drawn one in League One. 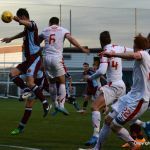 Raith and Stenhousemuir have been strangers in recent years with the last league game against the 2 teams coming 12 years ago, however it had been 38 years since they had met in a cup tie. 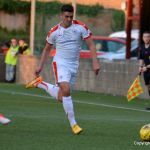 Ray McKinnon made 5 changes to the team that narrowly lost at Falkirk on Saturday as he freshened up the team to give the fringe players some game time. In came Petrie, Bates, Matthews, Davidson & Megginson to the starting line up with Callachan, Toshney, Stewart, McKeown & Craigen dropping to the bench. Dave McGurn also returned to the bench in place in place of Laidlaw. The low evening sun shone bright on Ochilview as Raith kicked off towards the Raith support at the Asda end of the ground. The Rovers started brightly and created their first chance in only the second minute, Megginson cross fell to McCord but his shot was just wide. 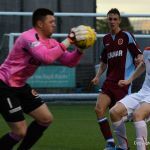 Megginson was again involved just a minute later as his cross was flicked neatly to Wighton whose shot headed for the top corner only for the Stenhousemuir keeper, Barclay to save well. 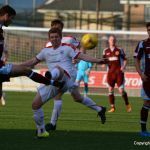 Six minutes later, Wighton created another chance as he turned well inside the box but his shot was blocked by the Stenny defence. 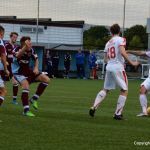 Raith certainly had the better of the opening exchanges and it took Stenhousemuir 14 minutes to create their first opportunity. 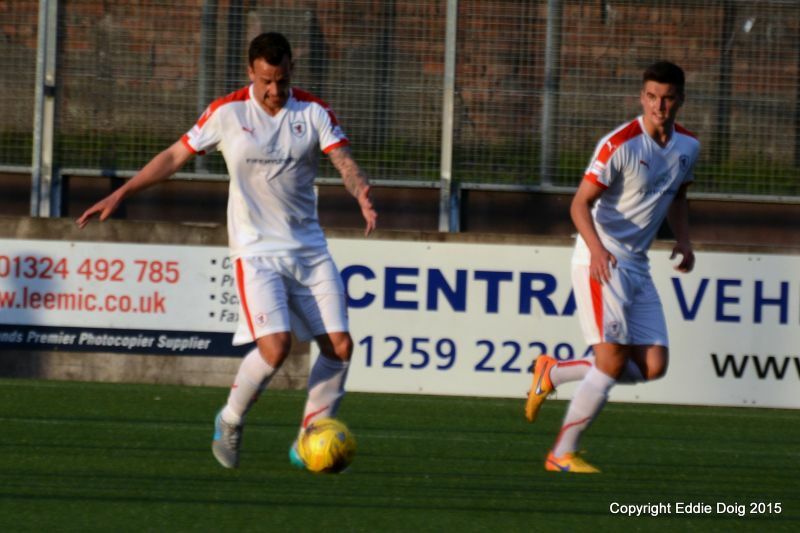 Cook fired a free kick deep into the Raith penalty box but Smith headed over the bar. The Rovers responded well a minute later with a cross from Wighton, picked up by Megginson but his angled shot was saved by the Stenny keeper. In the 22nd minute, the Warriors created the best chance of the game so far, the ball was crossed into the Rovers box, knocked down by McShane into the path of the Stenny number 9, Allan Smith who smacked a fierce shot against the stauntion of the woodwork with the Raith defence and Kevin Cuthbert motionless. 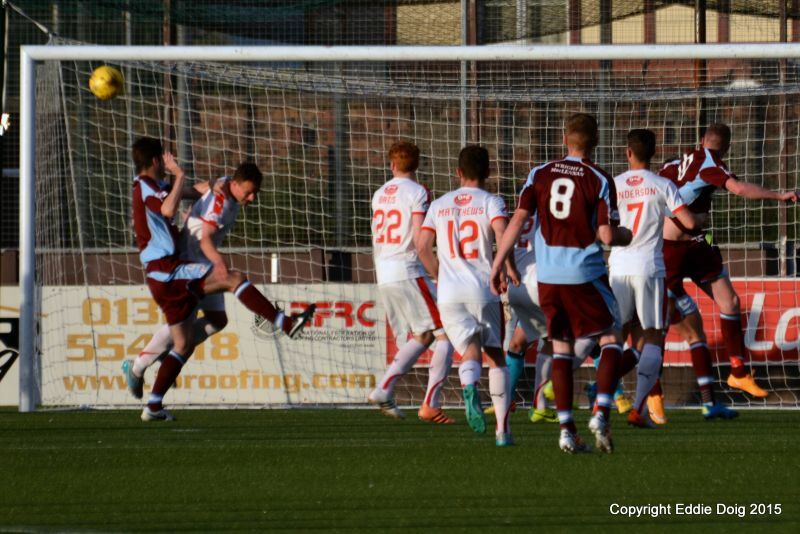 A huge let off for Rovers, but a clear sign that Stenhousemuir were right in this game. 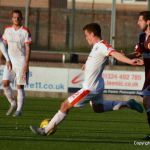 Grant Anderson then had a couple of chances, firstly he drove a volley just wide of the far post, then he had a shot blocked after McCord’s initial shot had been deflected. Anderson was having a busy period and was unfortunate to be booked for handball. 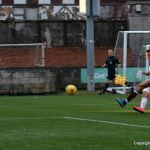 Stenhousemuir then came close again in the half hour mark, Stuart Malcolm headed towards the Raith goal from a deep cross and was thwarted only by a reaction punch clear from Kevin Cuthbert. 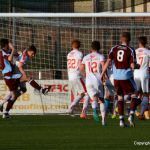 The Warriors were now on top and kept the Raith defence under pressure and this almost resulted in the opening goal 5 minutes from half time. Cook took the free kick into the box, McShane got a strong downward header onto the ball and it bounced just over and flew just inches over the bar. The Raith support were relieved to hear the half time whistle. 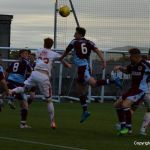 Raith may have started the game the better team but in the last 15 minutes of the half Stenhousemuir had become a real threat and were unfortunate not to go into half time in the lead as they had created the clearer cut chances. Raith were in for a fight and this was not going to be a straightforward win against the lower league side. Could the Rovers regroup and take charge of the game after the re-start? The answer to that was sadly ‘no’. 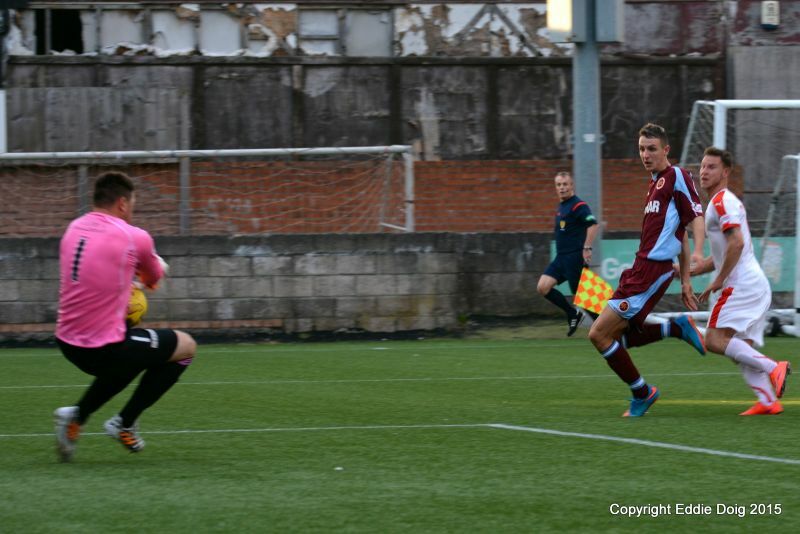 It was Stenhousemuir that started the second half with real intent. Just 2 minutes after the re-start, Allan Smith’s shot was saved by Cuthbert’s fingertips, then shortly after, Jon Robertson cracked a sweet volley from 25 yards out, but again, Cuthbert was at full stretch to save. Raith created their first chance of the second half in the 52nd minute, a great run from Anderson down the right hand wing resulted in him swinging in a great cross to Megginson just 12 yards out from goal, he turned well but just couldn’t get a shot on target. 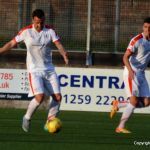 The match was delayed on the hour mark as the corner flag on the far side had broken – a new flag was dispatched from the main stand and in order to speed up proceedings, Kevin Cuthbert took the flag to deliver to the linesman. En route he waved the flag to the Raith support to a loud cheer. Those cheers were soon to be silenced though. 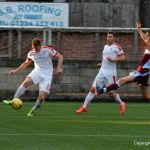 Stenhousemuir again took control, Jamie McCormack headed a cross onto the roof of the Raith goal, then from another free kick, Stuart Malcolm got a high header onto the ball towards the top corner but Cuthbert just managed to tip the ball over, clattering into the post as he did so. 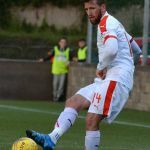 The Rovers were under pressure and were lacking an effective outlet in attack, so Ray McKinnon brought on Mark Stewart for Ross Matthews to bolster the front line. 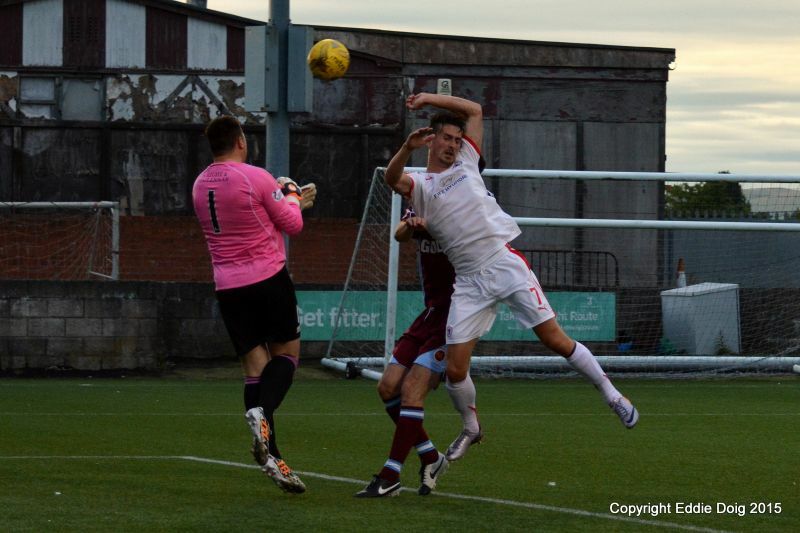 However, before Raith had the opportunity to adjust to their new formation, Stenny took the lead. From some neat passing play, Cook took possession at the far corner of the Raith box, he turned inside, unopposed, and struck a low shot beyond Cuthbert and in off the post. 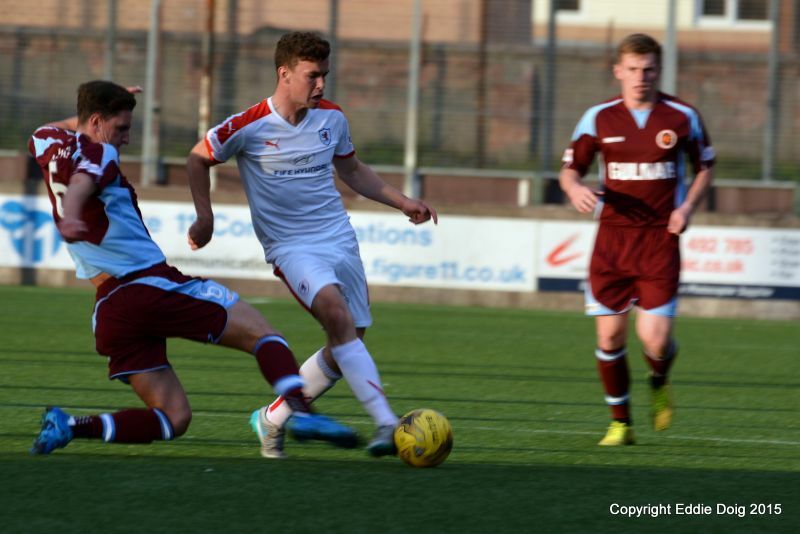 Stenhousemuir 1 Raith Rovers 0 after 67 minutes. 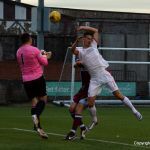 Raith responded with a superb chance, Megginson’s corner reached Wighton at the far post and he headed the ball firmly towards goal but came off the post. 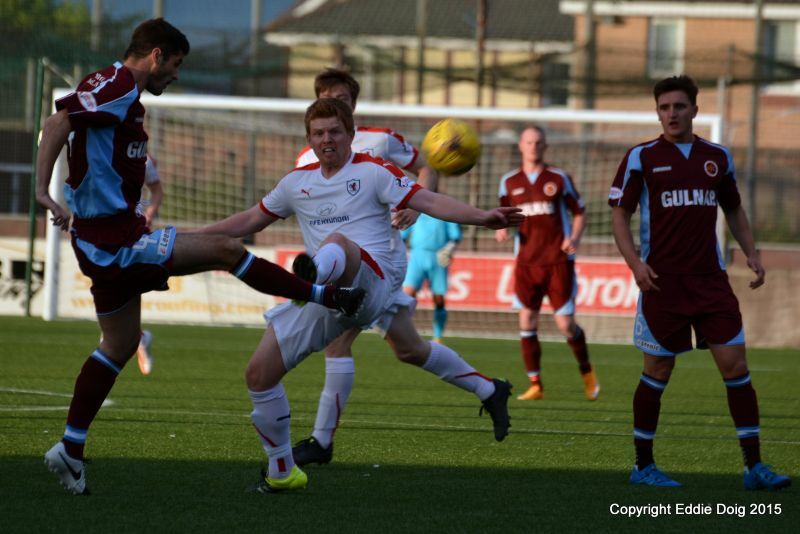 Just seconds after it looked as though the Rovers might be getting back into the game, Stenny struck again. 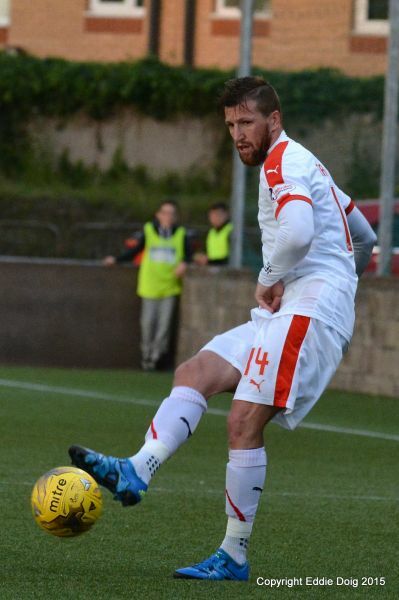 Stephen Stirling took possession of the ball 35 yards from the Raith goal and struck a sublime looping shot over the head of Cuthbert and into the back of the net. 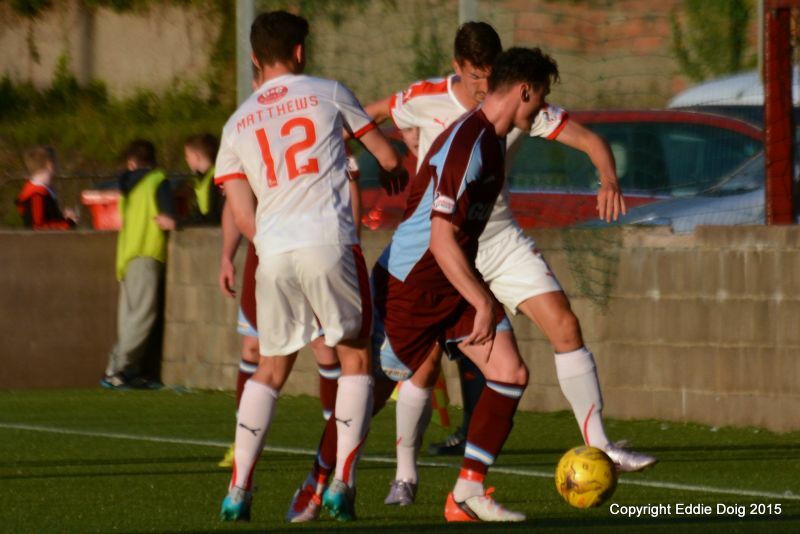 Stenhousemuir 2 Raith Rovers 0. That second goal completely knocked the stuffing out of the Rovers. There was never any sign that Raith were going to mount a serious comeback at any stage in the final 15 minutes. 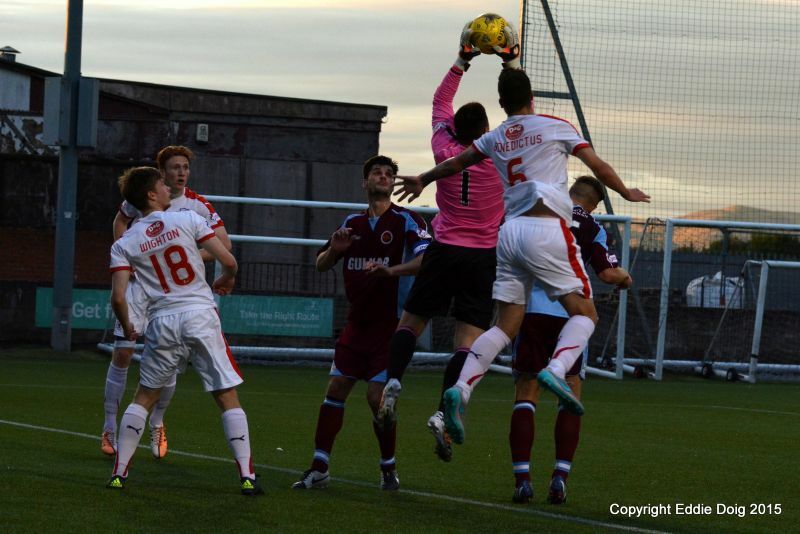 They huffed and puffed but the Stenhousemuir defence held firm. 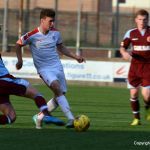 Ross Callachan came on for Ryan McCord and looked lively, but not enough of the players around him were showing the same endeavor. 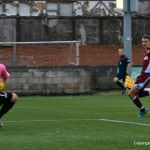 In the final minute, to compound the Rovers’ misery, Jason Thomson was given a straight red card for a tackle on Stenhousemuir’s Cook. A decision that looked harsh. 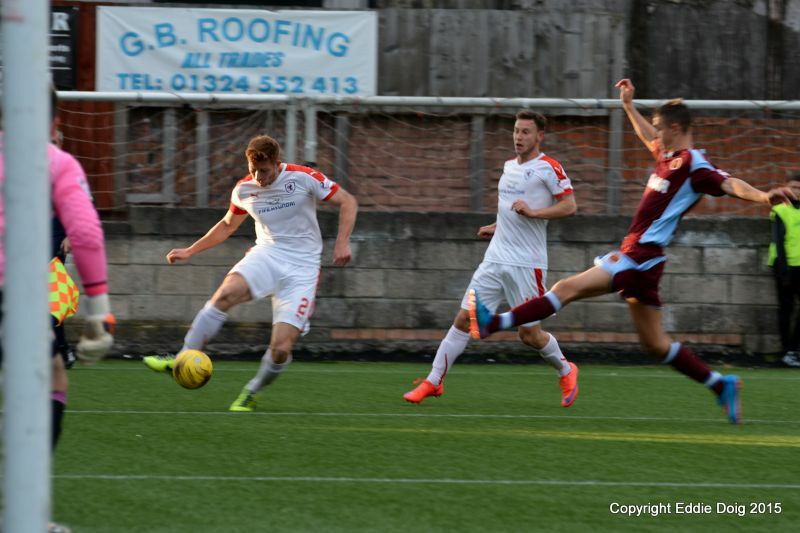 Moments later, the referee, Greg Aitken blew the full time whistle to the delight of the home fans. 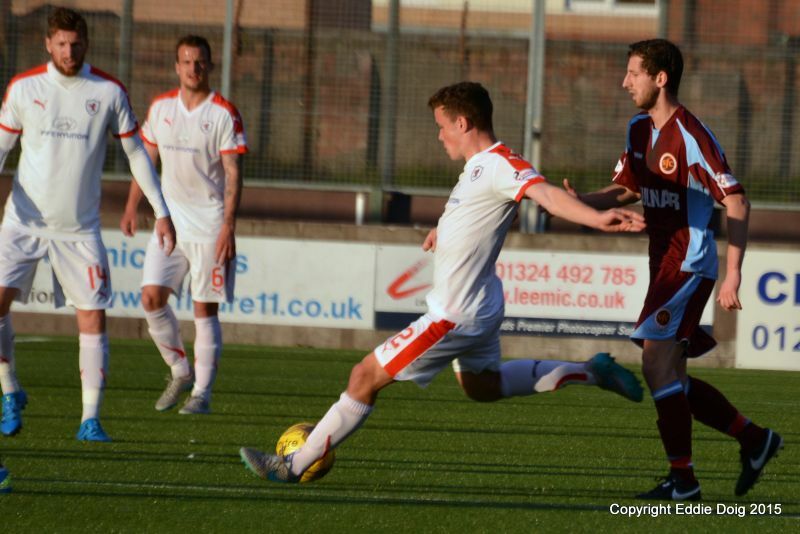 Stenhousemuir 2 Raith Rovers 0. Whilst the home supporters amongst the 449 crowd celebrated the Raith support left quietly and headed home. A cup shocker. A tremendously disappointing night for Raith Rovers who just looked lacklustre and second best for most of the evening. Difficult to give a man of the match award, but for Raith Rovers, Grant Anderson showed tireless running down the wing and got in a decent number of crosses into the box. 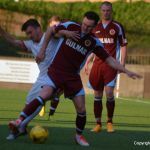 For Stenhousemuir, there were a number of heroes, not least goalscorers, Stephen Stirling & Alan Cook, but also their number 11 Alan Cook. 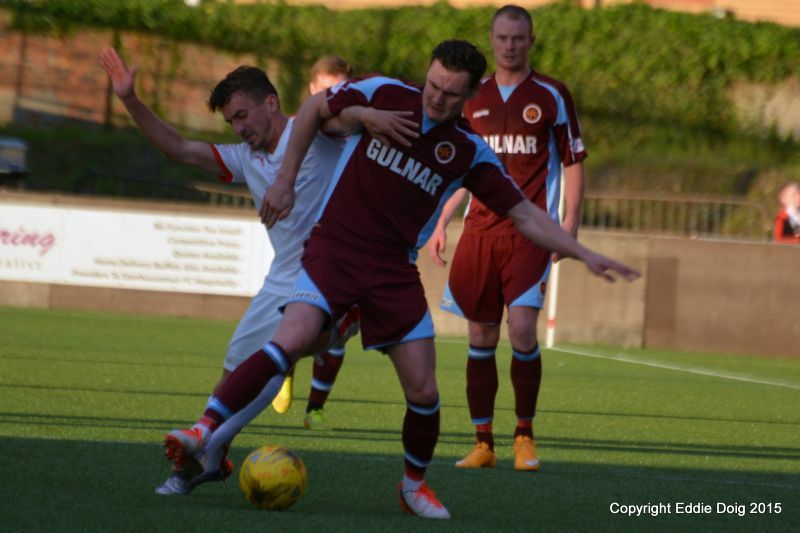 A great night for Stenhousemuir who will be dreaming of repeating their Challenge Cup success back in 1995. For Raith Rovers, a hugely disappointing night with so many of the team just not performing to their full ability and perhaps this reinforces the belief that the squad is lacking a genuine goalscorer. Back to league action at Stark’s Park against Alloa on Saturday, where Ray McKinnon will be looking for a reaction to two defeats in 4 days to get the league campaign on track. Welcome to a sunny Ochilview, it's 16 degrees and fair. The Warriors have Euan Murray who had a trial at San Starko, he has also played in the Solomon Islands. 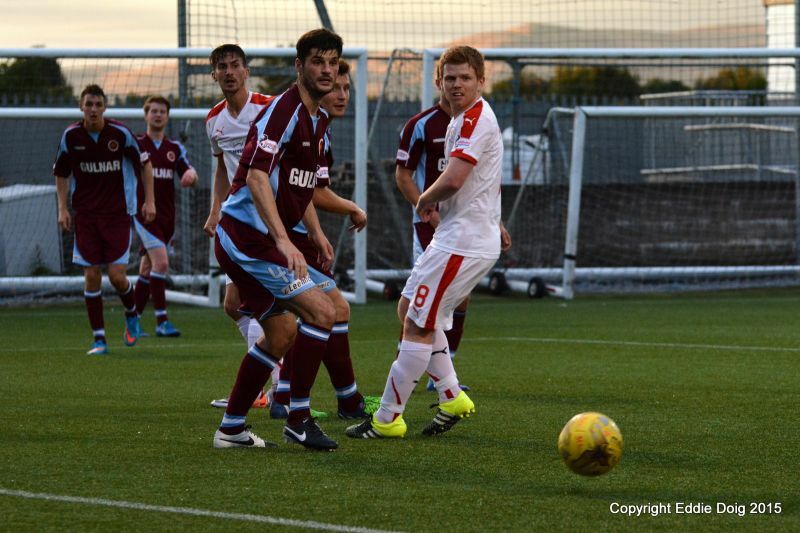 Stenhousemuir and the Rovers past winners of the competition, 95/96 & 13/14 respectively. The Warriors kick off to the left of the main stand. McCord with the first strike, going past the back post. Megginson crosses and Wighton tried for the top corner only for Barclay to block. Cook swings in a free kick but is cleared. Anderson with a wild cross, the away supporters scatter. Smith loops his header over at the back post. Barclay earning his corn diving to save from a Megginson rocket. 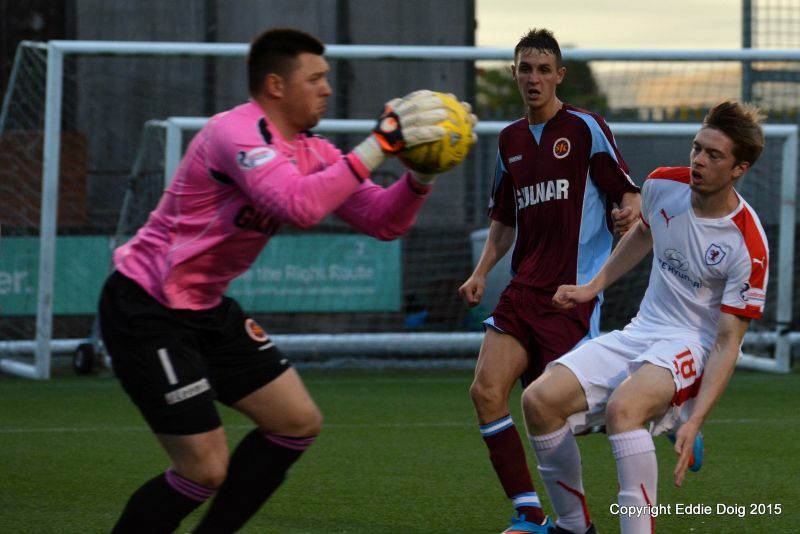 Stenhousemuir are having a go but are coming up against sterling defending. Smith turns to shoot , his effort trundles towards Cuthbert. Smith rattled the crossbar, the ball falling to him after a mix up with a loose ball. 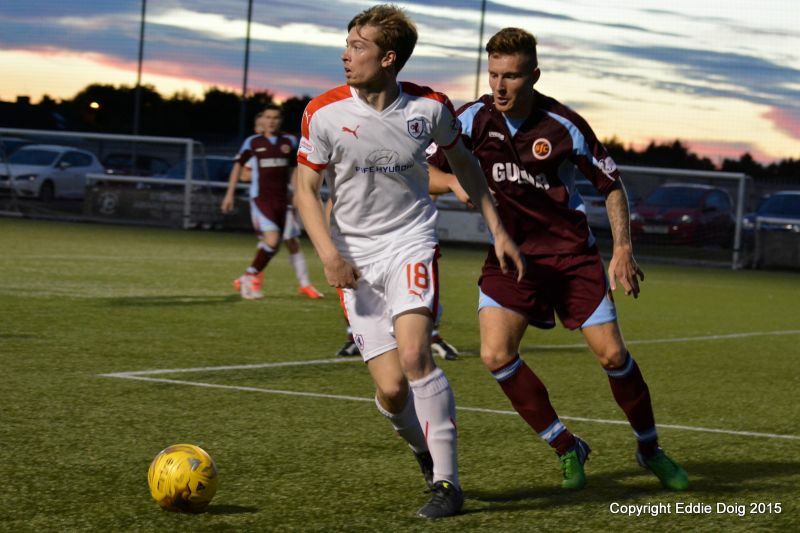 Wighton showing some skill trying to meg his defender. McShane looking for a penalty after going to ground in the box. Petrie with a free kick, the ball comes back as quick as it was delivered into the box. McCord then Anderson have close range shots blocked. Anderson yellow, accidental hand ball he claims. Malcolm heads for goal but the stand side assistant flags for offside. Thomson's free kick finds Benedictus clear, his header going wide at the back post. Matthews has a shot from distance blocked by Barclay . Bates gives away a free kick for rearranging the opponents apparel. Cook with a free kick from 20 yards finds McShane whose downwards header bounces over the bar and lands on the roof of the net. Barclay spills the ball but recovered a cross from Anderson. Benedictus hasa header cleared at the back post. Smith strikes, the ball is parried by Cuthbert and cleared by Thomson. Robertson from distance forcing Cuthbert into a diving save. Megginson with a header from the edge of the area sees it cleared by Barclay. The Warriors have started brightly. Wighton through, is denied by Murray. Anderson crosses to Megginson who turns and shoots narrowly wide. Davidson coming close with a shot from 6 yards. Play has halted due to a missing corner flag. Play resumes with McCormack heading over the bar. 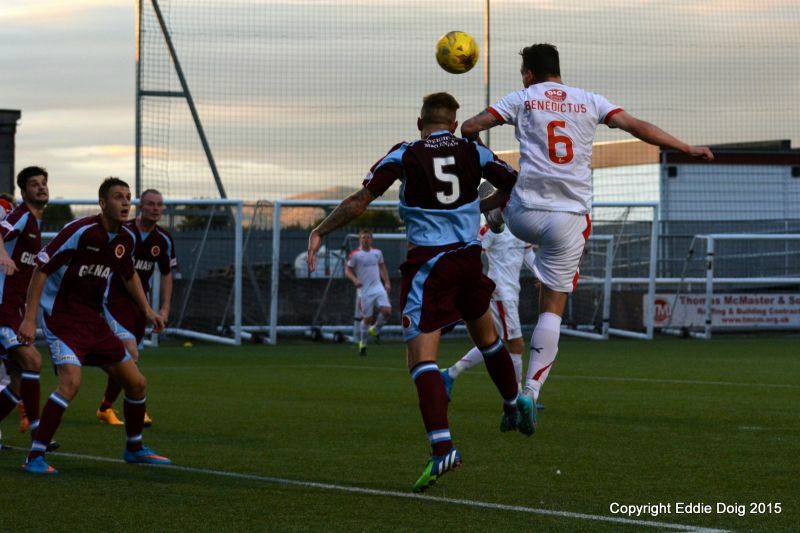 A header from Malcolm is tipped over by Cuthbert. Within seconds of coming on, Stewart is through but is flagged offside. Alan Cook from the edge of the box sees the ball go in off the bottom of the post. Stewart has a cross intercepted by Murray for a corner. 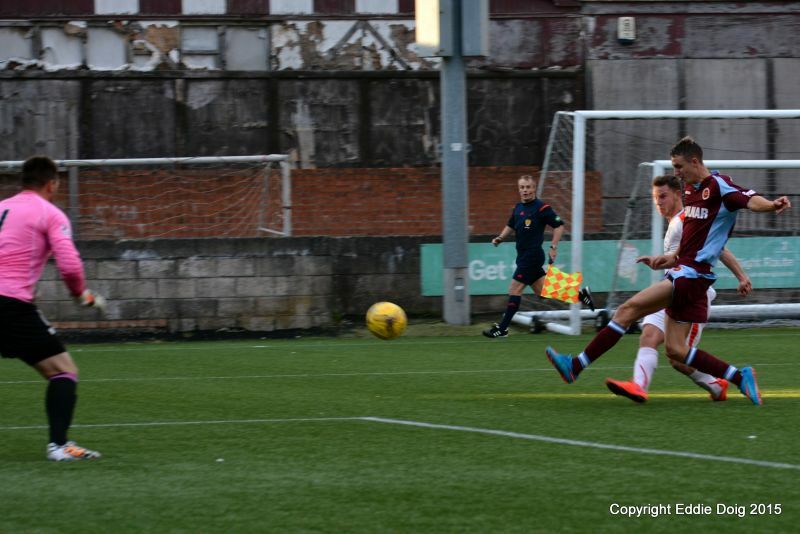 Goal Stenhousemuir, Stirling catching Cuthbert off his line and shoots from 35 yards. 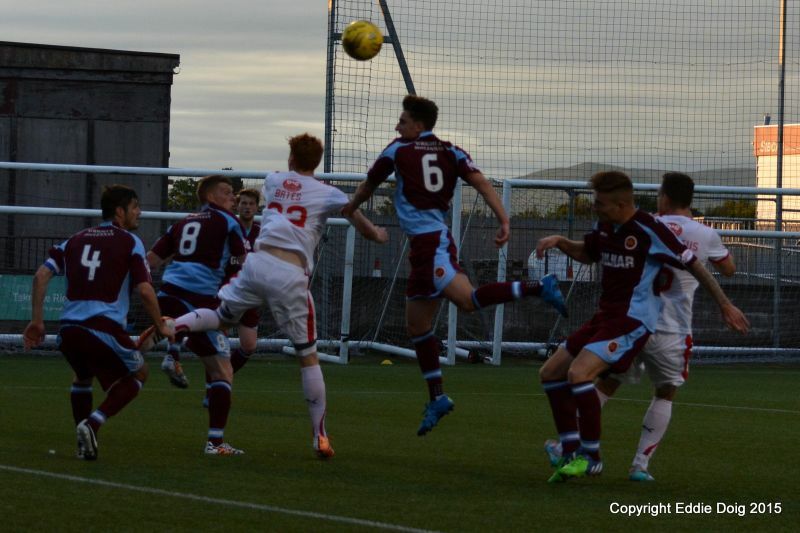 Callachan's glancing header going just past the post. 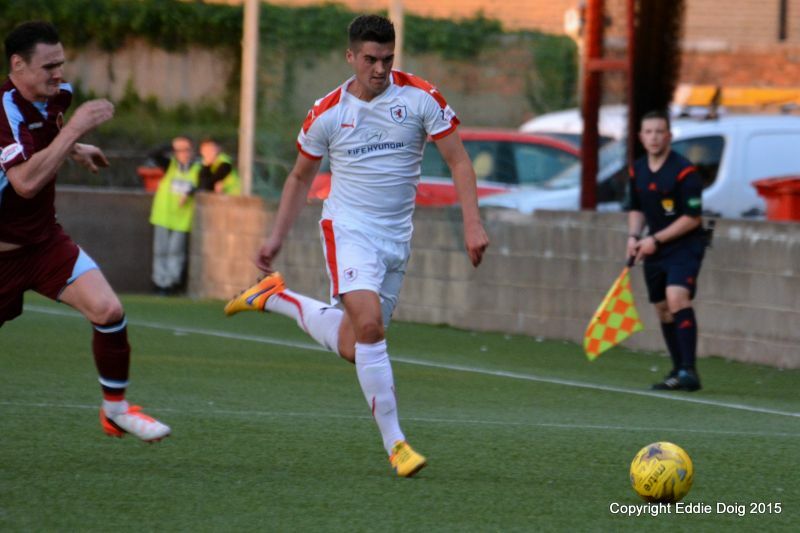 Rovers pushing forward looking to get back in the game. Long balls out of defence to Stewart at the moment. McMenamin using his experience , stopping Rovers recycling the ball. Anderson into Stewart, his shot going for a corner. Bates through and foiled by Barclay. +1 Thomson straight red for a foul on Stirling. +2 Smith off, Eddington on. +3 Stirling off, MCROARY on. Barclay, McCormack, Henderson, Malcolm, Murray, Mechan, Stirling, Robertson, Smith, McShane, Cook. Subs, Shaw, Hamilton, Marenghi, McMenamin, Eddington, Mazana Martinez, McRoary. Cuthbert, Thomson, Petrie, Bates, Benedictus, Matthews, Davidson, McCord, Anderson, Megginson, Wighton. Subs, McGurn, McKeowan, Callachan, Toshney, Stewart, Craigen, Ellis. 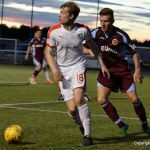 Raith Rovers may have lost their first game of the season to Falkirk on Saturday, but they’ve a chance to bounce-back immediately this Tuesday evening, when they take on Brown Ferguson’s Stenhousemuir side at Ochilview, in the Second Round of the Petrofac Training Cup. 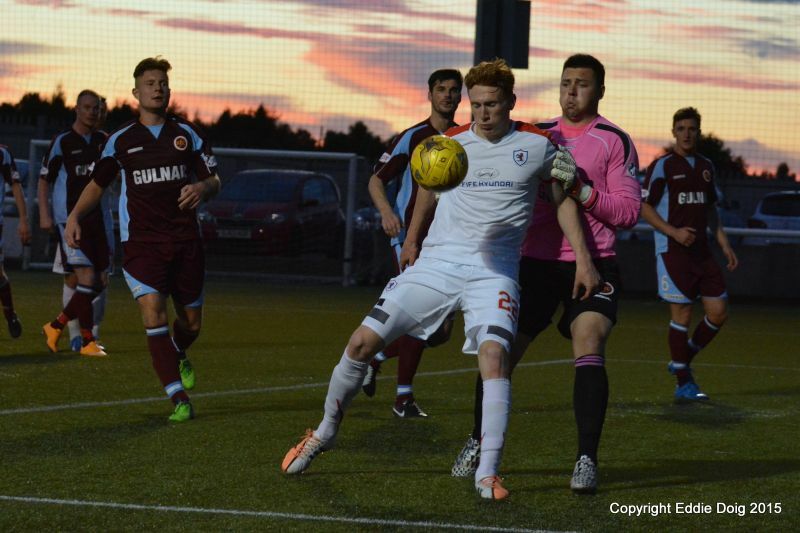 Like Raith, The Warriors reached this stage by knocking out a team from the tier below them in the last round, defeating East Stirling by three goals to two. 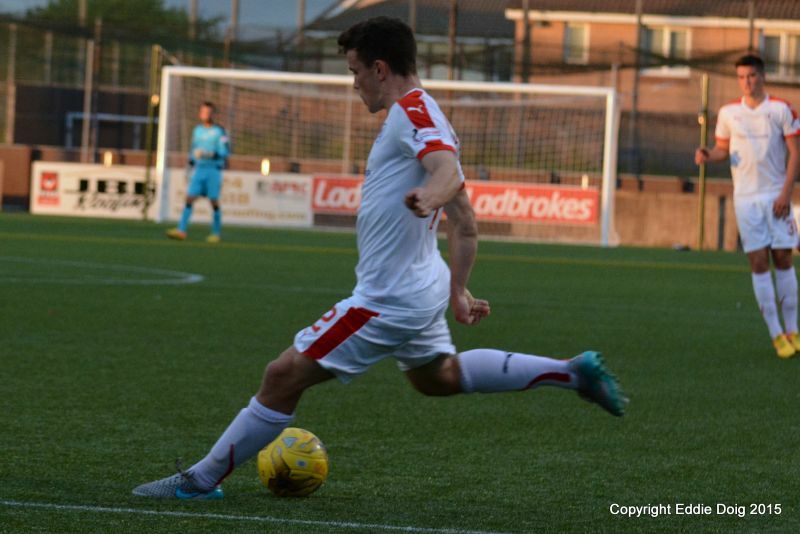 Ex-Raith defender, Reece Donaldson opened the scoring for East Stirling, but a brace from Stephen Stirling and one goal from Colin McMenamin took Stenny through, despite a late riposte from David McKenna. 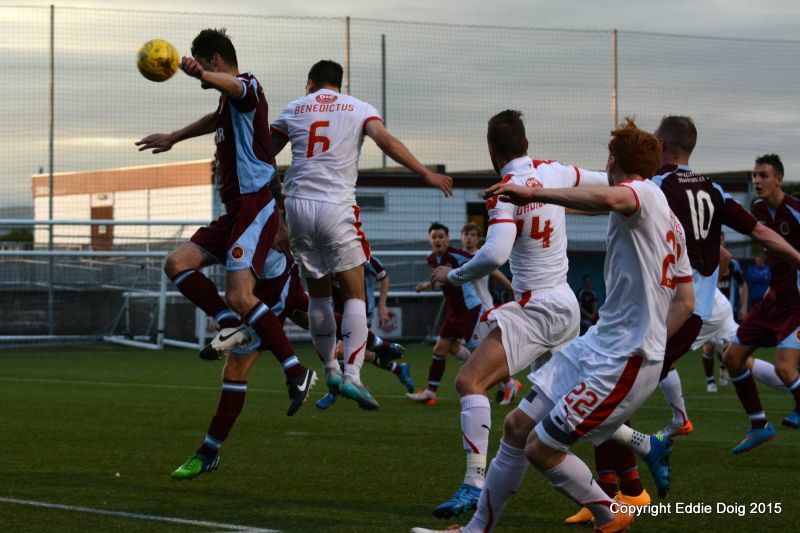 Stenhousemuir have made a bright start to League One, taking four points from their first two matches. 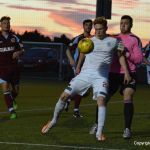 Their opening match against Peterhead at Balmoor, saw them race into a two goal lead inside ten minutes, thanks to strikes from Euan Murray, who was in trial at Stark’s Park in the summer, and former Dunfermline forward, Allan Smith. 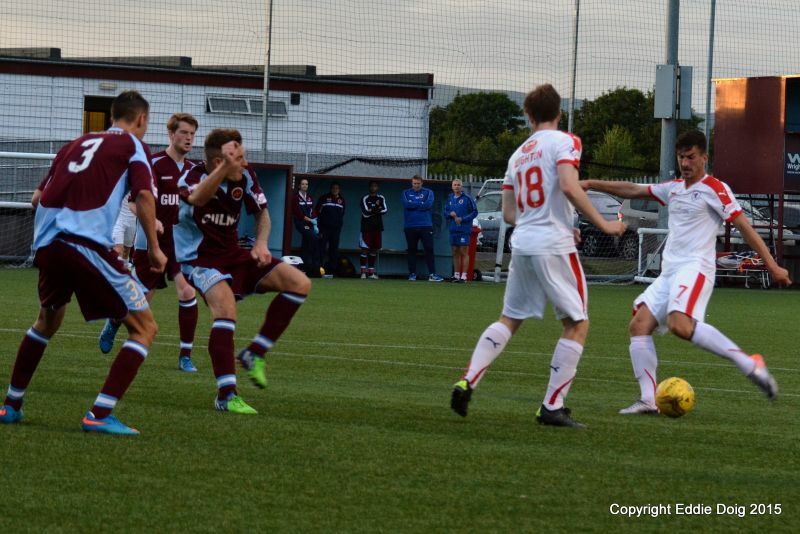 However, they were pegged back to 2-2 after a dismissal to Stuart Malcolm early in the second period. 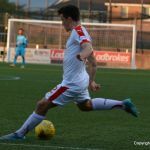 Saturday saw them pick up their first three points of the season, when a Fraser Eddington goal in injury time, saw them clinch a 2-1 win over Airdrie, a victory which took them to fourth place in the embryonic League One table. 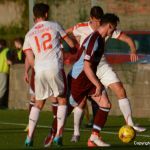 It’s been 12 years since these two sides last met, a Second Division match which ended in a 1-0 win for Stenhousemuir in March 2003, and it’s been considerably longer since they came together in a cup-tie. December 1977 was the last time they were paired together in a knock-out competition, with Rovers scarping through to the second-round with a 1-0 victory. 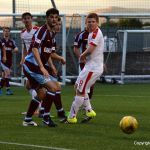 Rovers do have an impressive head-to-head record against Stenhousemuir down the years, with seven wins and three defeats in the last ten meetings, a sequence that includes a 9-2 home win in November 1985. Tuesday evening’s match referee will be Greg Aitken.